Are you looking for a Snohomish County Christmas Tree Farms? Would you like to choose and cut your own Christmas Tree close to Snohomish County? 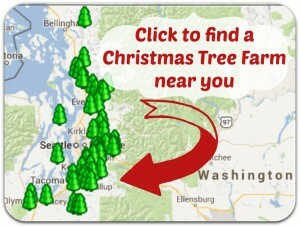 At our site you can locate a Choose & Cut Christmas tree farm in your area by clicking on the Puget Sound map near your location. Map information is updated every October. Most of the farms listed offer u-cut and fresh cut Christmas trees, tree netting or baling, and personal assistance in choosing your tree. You can find almost anything for your special holiday including wreaths, swags, holly, cut green boughs, pine cones, mistletoe, tree stands, gifts, decorations, and crafts. Some farms also provide shelter with complimentary hot chocolate, cider and candy canes. Some of our member farms offer the following amenities: tall, flocked or living trees, delivery, Santa or Mrs. Claus, petting zoos, picnic areas, u-dig fire pits, table tops, hay rides and bake sale cookie. Check the individual farm listings for more information.